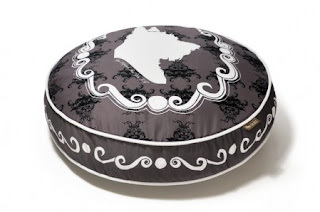 We've been on the hunt for a new dog bed for awhile... one that would be both comfortable for Cosmo AND stylish enough to look great in our living room. So when we heard about a new pet bed company that focuses on great design and quality, and uses planet-friendly materials, we had to check them out. In additional to all the above, P.L.A.Y. beds are priced right and offer the option to purchase covers separately, so you can change your look with each season. Turns out that's a great option since the biggest problem we had was choosing just one. 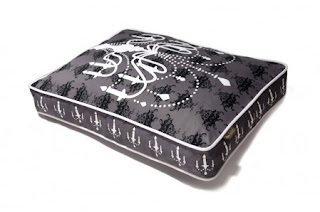 After careful deliberation, we chose the small Savannah bed to complement our living room decor. At first, I thought it might be too small. But after a few weeks of naps and lounging about, Cosmo has convinced me it's just right. Tip: If your dog is near the top-end of the suggested weight for each bed size, consider going up a size, especially if you have the room for it. I'm still glad we opted for the small for our bungalow-sized living room... and my bungalow-sized pup. Regarding style and quality, I love the look of the bed and the quality is top-notch. The piping and seams are stitched beautifully and the custom zipper on the under side makes it easy to remove the cover for washing. From the Artist Collection, the Cameo and Chandelier are suitably glamorous for Cosmo. 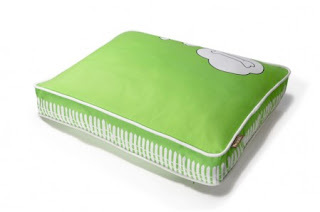 For my home office, I like the whimsy of What Dogs Dream in lawn green. Scoop! While current designs are fabulous in round and rectangle cushion-style beds, we hear a "bumper" style bed is in the works! Can't wait to see that one too. As far as Cosmo is concerned, he loves his Savannah bed and says, "enough already with the photos! Nitey nite!" Coming up: We've had the bed just a few weeks and there's been no need to wash it. The fabric seems to stay clean and is really durable too. When we do, we'll post the results of the machine-washing. Disclaimer: P.L.A.Y. sent us a complimentary dog bed to review. We were not paid for our review and all opinions are strictly our own. great review! I wonder how these beds would stand up to a big fellow like me!?! We saw the bumper beds at Global Pet Expo... and they are AWESOME!!!! We knew Cosmo would love his P.L.A.Y. bed!!! Murphy - You ARE a stately Dane! It says they are sized up to 110 pounds. hmmm, may need to get one for human use. L+D - Thanks for the tip! It's hard to stop at just one! When somebody in the family becomes ill, or a relative's vehicle separates, these additional costs can truly put numerous families in a genuine sticky situation. Once an advance reaches the default position, the auto will be repossessed and sold for benefit. An immediate payday bank does not benefit guarantee credits but rather still work with sub-prime borrowers who qualify. The application procedure for online auto title credits likewise fluctuates relying upon which moneylender you pick, however here are the general strides. In circumstances where you neglect to reimburse the sum as required, you can roll the advance over by paying extra expenses to the bank alongside the premium gathered over the move over span. Credit sharking is yet another wording used to allude to the payday advances. Every money related advance are there to be utilized with caution, and a full comprehension of the terms and conditions that are associated with them. Obliviousness is not a reason.